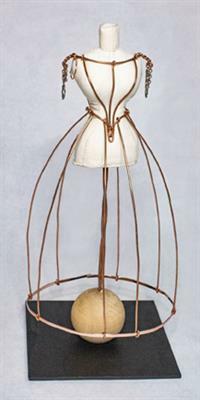 The artists of the Hillsborough Gallery of Arts respond, in their own mediums, to “Behind the Scenes” a memoir by Elizabeth Keckly, an enslaved member of the Burwell household in 19th century Hillsborough. The show caps the year-long commemoration of Keckly’s life and her time in Hillsborough. 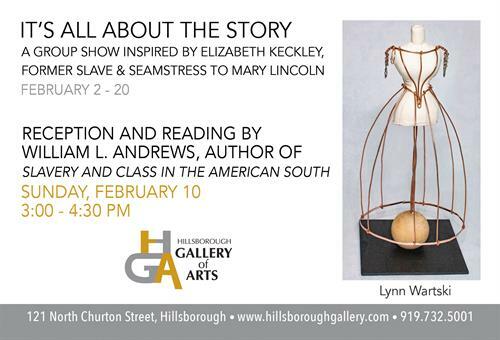 In conjunction with the show, a reading by Dr. William L. Andrews from his new book “Slavery and Class in the American South” is being hosted at 3pm on February 10th at the Hillsborough Gallery of Arts. Dr. Andrews is the Maynard Professor of English at the University of North Carolina and an expert in African American literature, Southern literature and North American slave narratives. A reception and book signing will follow the reading. Located at 121 N. Churton St., Hillsborough NC, the gallery is owned by 22 local artists and features painting, sculpture, photography, glass art, jewelry, wood, pottery & fiber art. Winter hours: 10-6 Monday - Saturday, 12-4 Sunday. 10-6 Monday - Saturday, 12-4 Sunday.